On July 2 at Image Expo in San Francisco, Image Comics partner and THE WALKING DEAD creator Robert Kirkman announced his plans for the tenth anniversary of his iconic, game-changing comic book series, taking place in October 2013. That month, “All-Out War,” a new 12-issue story arc will launch with THE WALKING DEAD #115, with, in addition to the regular covers, ten connecting variant covers by series artist Charlie Adlard. Issues #115-126 will be released bi-weekly, starting on October 9. 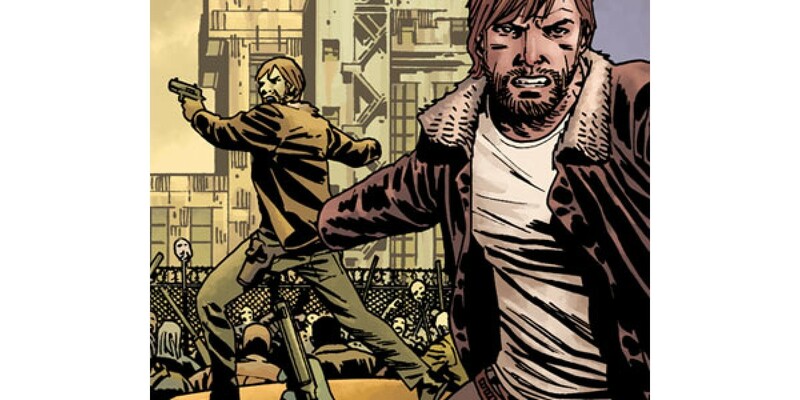 Also to be released that month is THE WALKING DEAD #1 in color for the first time ever. Award-winning colorist extraordinaire Dave Stewart will giving a new vividness to Tony Moore’s art in the classic first issue with art. Fans of Tyreese will be happy to see the favorite character get his moment in October as well, with the release of THE WALKING DEAD TYREESE SPECIAL, which reprints his first appearance in THE WALKING DEAD #7 and his origin story that originally appeared in THE WALKING DEAD: FREE COMIC BOOK DAY SPECIAL. And THE WALKING DEAD readers will be able to choose their side in “All-Out War” with T-shirts that announces their allegiance to Rick Grimes’ “Survivors,” Jesus’s “Hilltop,” Negan’s “Saviors,” or Ezekiel’s “Kingdom” factions.